UPDATE (8:35 p.m.): Christine here, taking over for Matt. Here's the Gianforte campaign's statement. UPDATE (11:12 p.m.): Fox News has confirmed Jacobs' account. We’re on the eve of Montana’s special election to see who will succeed Republican Congressman Ryan Zinke, who became secretary of the interior in the Trump administration, and it’s ending with a body slam. I’m not kidding, folks. Republican candidate Greg Gianforte body slammed The Guardian’s Ben Jacobs. A local news crew was preparing for an interview with the candidate when the incident occurred. Audio is said to have been recorded and will be posted, according to Jacobs. BuzzFeed’s Alexis Levinson, formerly of National Review, documented what happened, which was captured by our friends at Twitchy. That said, we as a group are not sold on either candidate. Call that a cop-out, if you will, but recommending a candidate to be Montana’s sole representative in the U.S. House of Representatives shouldn’t come down to a lesser of two evils. For the state of this race, we place much of the blame on the Democratic and Republican parties of Montana. When former Rep. Ryan Zinke was named the nation’s secretary of the interior, each party’s state delegation had the rare opportunity to vet and nominate a candidate it reasoned best represents its members. Rather than offer up remotely moderate candidates, each party nominated candidates from its far right and left. In fact, you’d be hard-pressed to find two candidates with more divergent views. That shouldn’t be the case. Most Montanans don’t view themselves on the fringes of the political spectrum, and it’s unfortunate the candidates in this race don’t reflect that. As a state and a country — and as voters — we deserve and must demand better. UPDATE: Here’s the audio. Jacobs asked Gianforte about the CBO score on the GOP health care bill, which was released today. Gianforte told Jacobs to get in touch with his staff. Jacobs noted that there wouldn’t be enough time for him to get a quote, which prompted the physical altercation. “Get the hell out of here,” yells Gianforte. 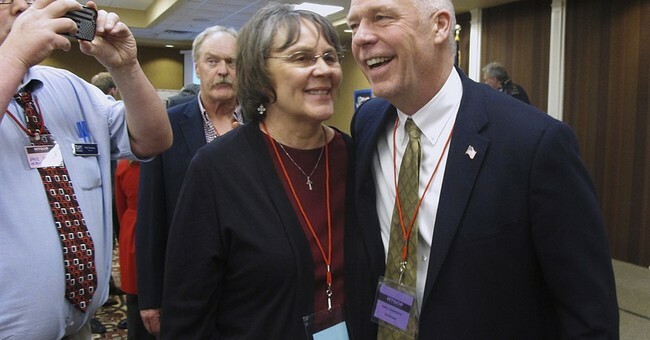 Levinson added that Gallatin County Sherriffs are interviewing witnesses, and that the this altercation occurred at a campaign Meet and Greet event with Gianforte in Bozeman.